If you look until 2015 or so, the inflation data basically followed our models, emphasizing the role of weakness in the economy. Where this mystery has happened is really in the last year or two. I view both inflation picking up faster than expected in early 2017 and now the pullback as just part of the variability that’s going to happen. I don’t see any signs that somehow the inflation process is fundamentally changed. I’ve been doing this a long time, and the Phillips curve has been declared dead far more times than Mark Twain. This is representative of the conventional wisdom at the Fed, summed up succinctly as adherence to a basic expectations-augmented Phillips curve as a primary policy guide. 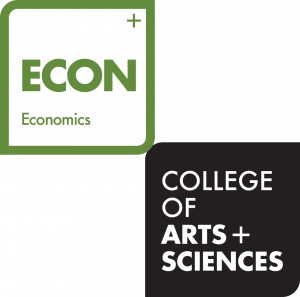 As unemployment falls toward and below full employment, capacity constraints in the economy tighten and eventually create inflationary pressures. The central bank needs to offset these pressures via tighter policy to contain inflation and maintain inflation expectations, the center of gravity for actual inflation over time. …in today’s economy, there are reasons to worry that the Phillips curve will not prove very reliable in boosting inflation as resource utilization tightens. The substantive point is that we do not, at present, have a theory of inflation dynamics that works sufficiently well to be of use for the business of real-time monetary policy-making. The latter two represent some of the pushback to the conventional wisdom at the Fed. The Phillips curve is argued to be empirically flat to such a degree that it is currently almost useless as a policy guide. Moreover, policymakers don’t have a good understanding of these all-important inflation expectations. Critics of the conventional policy argue that central bankers should be much more cautious about using the Phillips curve as a policy guide. Proponents argue that abandoning the Phillips curve now will leave the Fed behind the curve when fighting the inevitable inflation ahead of us. Proponents maintain the upper hand on Constitution Ave. And I think I think they are not without good reason. From their perspective, policy outcomes when following the conventional wisdom compare favorably to the monetary policy debacle that was the 1970s. Given that success, why risk pursuing an alternative strategy? To visualize the Fed’s successes and failures, consider the realized deviations from their mandate since 1961. Although the Fed does not have an official inflation target prior to 2012, I think it is reasonable to consider two percent as consistent with the definition of price stability – or, at a minimum, goof policy – throughout this entire sample. The definition of meeting the employment mandate is unemployment at the CBO’s estimate of NAIRU. As is evident in the chart, policy outcomes deteriorate beginning in the late 1960s with increasing and increasingly variable unemployment and inflation. 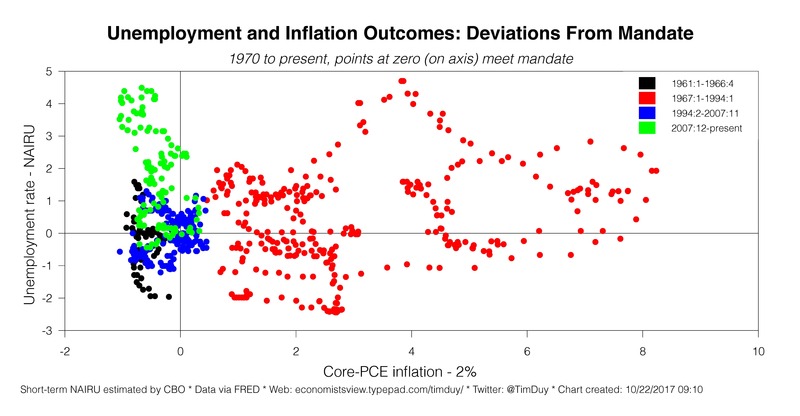 The situation does not full revert to more consistency with the mandates until the mid-90s, by which time inflation returns to a low level, generally 2 percent or below while the economy remains more consistently near full employment. Importantly, at least according to the Fed’s conventional wisdom, inflation expectations stabilized at a level consistent with price stability since the mid-90s. 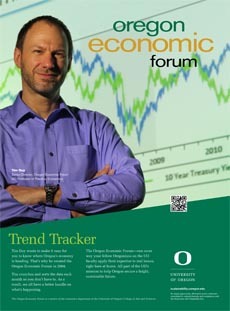 What about the high unemployment rates during the Great Recession? Doesn’t that substantial deviation from mandate indicate a failure of the Fed’s framework? I would argue that it does not. First, I would argue the roots of the Great Recession lay more in regulatory failures than monetary policy failures. Second, the fact that inflation did not spiral to zero and below despite such high unemployment indicates that the Fed was largely appropriately responsive during that period. Third, the economy returned to meeting the Fed’s mandates in fairly short order; outcomes did not spiral out of control as they did in the 1970s. When reflecting on this history, one point that I think is forgotten is that while there is intense focus on the Fed’s current shortfall in meeting its target, that deviation in no way compares to the deviations of the past. We often fail to see the luxury in debating a 50bp miss rather than a 500bp miss. 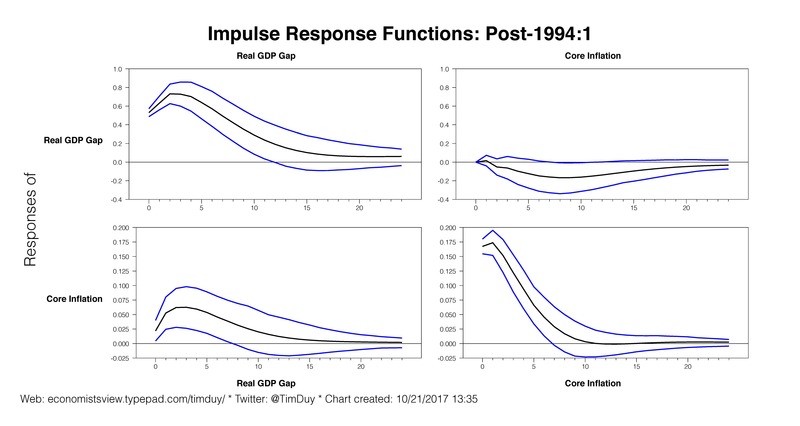 Another way I visualize the improvement in policy outcomes is via the impulse response function from a simple two-variable vector autoregression of the output gap and inflation (this is an example I use in my monetary theory class). Again, rather than breaking the sample at 1984 as is common (pre- vs post-Great Moderation), I break it at 1994 with the later period being one of stable inflation expectations. 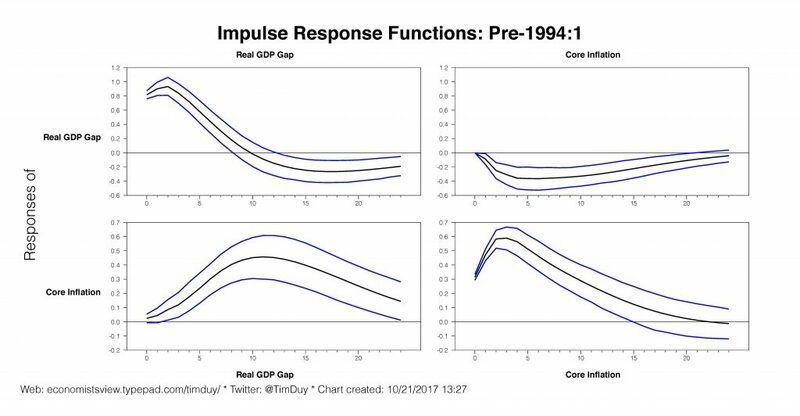 The takeaway from the impulse response functions is that since 1994, the economy experiences smaller and less persistent shocks. Importantly, inflation shocks have virtually no impact on the output gap, something that might be expected under stable inflation expectations.